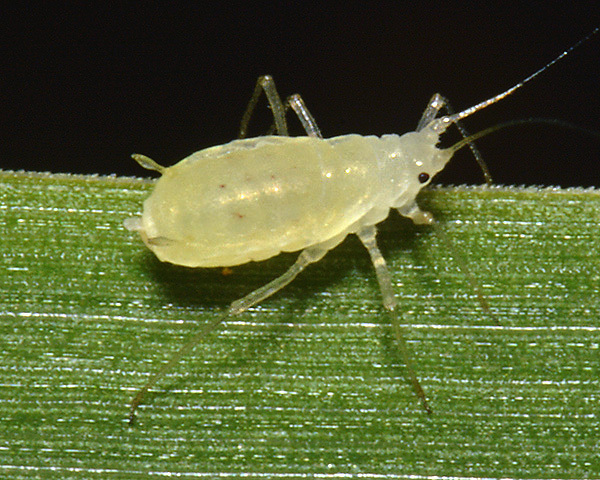 Rhopalomyzus are medium-sized yellowish to black aphids, the adult viviparae of which may be winged or wingless. The head has well-developed antennal tubercles. Marginal tubercles are frequently present on the prothorax and abdominal segments 2-6. The siphunculi are swollen with a small, but well developed flange, slightly constricted just under the flange. The cauda is tongue-shaped and shorter than the siphunculus. Winged forms have head, thorax and dorsal abdominal cross bars or a large dorsal abdominal patch. There are 9 Rhopalomyzus species, host alternating from honeysuckle (Lonicera) to grasses. They have a sexual stage in the life cycle, overwintering as eggs on honeysuckle. Overwintering eggs on the primary host Lonicera (honeysuckle) hatch to give fundatrices (not pictured here) which have a dark green body, powdered with greyish wax, and dark siphunculi and cauda. These fundatrices only produce alatae which have a yellow abdomen with a dark dorsal patch on the middle tergites and smaller marginal and postsiphuncular sclerites. The alatae migrate to the secondary host (grasses) where they produce large numbers of pale cream apterae (see pictures below). Their antennae have the apex of antennal segment 3 and segments 4-6 dark. The antennal tubercles are well developed and diverging; the median frontal tubercle is broad and flat. The siphunculi are pale and strongly swollen with the width near the distal end 1.7-2.0 times the basal width. The siphunculi are 1.3-1.6 times the length of the pale cauda (cf. Rhopalomyzus poae which has siphunculi 1.9-2.5 times the length of the cauda). The body length of the adult aptera of Rhopalomyzus lonicerae is 2.0-2.6 mm. Second image copyright Sandy Rae, all rights reserved. The alate Rhopalomyzus lonicerae has a variably developed patch on adominal tergites 3-5 and fragmented cross bands on tergites 6 and 7. Rhopalomyzus lonicerae host alternates between the primary host, honeysuckle (Lonicera) and the secondary hosts which are various grasses (Poaceae), especially reed canarygrass (Phalaris arundinacea). 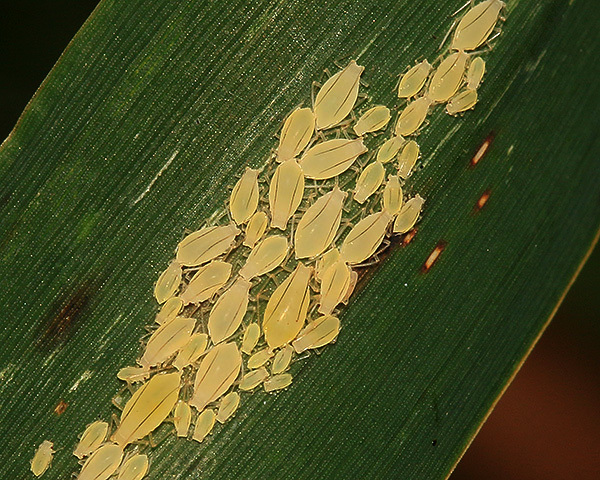 The leaves of the grass may be densely covered by aphids. It has a sexual stage in the life cycle, overwintering on the primary host as eggs. Rhopalomyzus lonicerae is found throughout Europe, central Asia and Siberia.